The high resolution ultra wide monitors continue to draw the attention of onlookers, there’s no doubt that these beauties are head turners. The LG 34UC98 is a 34″ wQHD screen that can pack pixels in at a whopping 3,440 x 1,440 resolution. Add to this the inclusion of FreeSync and a stunning IPS display and you can already tell that this model is not going to come cheap. 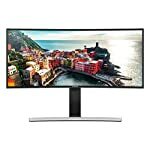 The LG has some solid competition too with the likes of Samsung and Dell releasing 34″ ultra wide models with similar appeal to gamers looking for large high performance screens. These ultra wide monitors need good support to keep the steady. Fortunately the LG comes with a broad stand that’s almost the width of the screen itself. This provides a study base without being too intrusive on your desktop. In fact it looks rather elegant and matches the overall premium feel of the monitor splendidly. 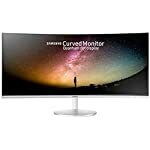 You only get height and tilt adjustment, I don’t think the lack of swivel is a deal breaker and a 90 degree rotation makes no sense on an ultra wide curved screen! Whilst the stand has a solid feel the plastic components feel less sturdy. It doesn’t detract from the overall look, but it does detract from the overall premium feel. Round the back you’ll find plenty of plugs to help you connect up your PC, or Mac. There are two HDMI ports, DisplayPort, and a pair of ThunderBolt 2.0 ports. I’m more of a PC guy so can’t really comment on the nature of the ThunderBolt port but PC owners are well catered for too. There are two USB ports, one of which is ready for charging. The LG 34UC98 comes with FreeSync technology to ensure a smooth tear free image when playing fast paced games. You’ll need an AMD card to take advantage of this technology right now, but assuming you have a compatible card it’s a feature that will improve your gaming experience. Note that the quoted FreeSync range if 55-75Hz. This seems like a fairly high lower bound and it seems quite likely that graphics cards will dip below this frame rate when running at 1440p. Games that support the ultra wide format look very impressive at 1440p, they really come to life. Professional technical reviewers have highlighted a middling contrast ratio but report colour accuracy as a high point for the LG. What’s more the out of the box experience is reported as positive with further calibration only yielding mild improvements. We give the LG 34UC98 a 4.5 out of 5 rating. Want to know what existing owners of the monitor think? You can read real user reviews here. 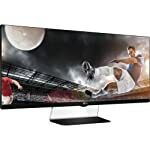 Should I buy the LG 34UC98? The LG 34UC98 offers FreeSync gaming and a 75Hz refresh rate whilst running at ultra wide QHD resolution. 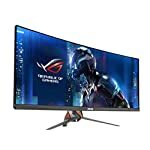 This high performance monitor delivers a lot but it's not cheap either. If you are having some doubts about this purchase then why not read some real owner reviews and see what other buyers think. 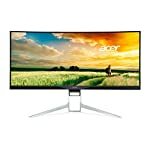 Welcome to the LG 34UC98 FAQ. This section attempts to answer common questions you may have, please get in touch if you have any more queries or if you think our answers need updating. Can I use this with my Apple Mac computer? I’m no Mac expert but this monitor does include a Thunderbolt 2.0 port.